The logo usage right must always be confirmed with the editorial staff. The logo may be used in connection with the tested product for one year starting from the magazine’s publication date (October 17th, 2018), unless agreed otherwise. It is required to include the issue number (19/2018) together with the 4-star logo. Direct quotations (with a limit of 64 words) from the article can be used together with the TM logo, but the quotations must match the review result. It is not permitted to use citations out of context. 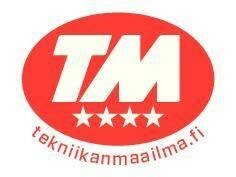 It is not permitted to copy Tekniikan Maailma’s articles for marketing use or to be distributed in connection with the product’s sales.